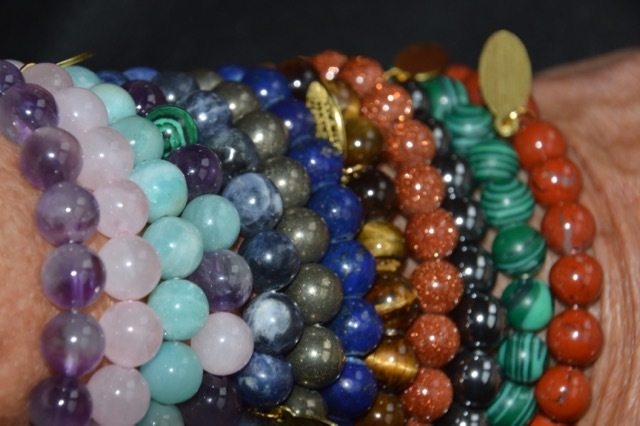 The Holistic Health For All Bracelets are Energy bracelets made out of 11 different types of gemstone crystals. Each of these gemstones has healing qualities of their own and additionally blessed with energy on 6 levels of optimal health: spiritual, mental, emotional, relationship, prosperity and physical. Wear the energy bracelet to remember the receiving prayer below. clearing with light, grounding and receiving all we need in every way every day. Visualize and feel yourself with all existence celebrating having Holistic Health For All on 6 levels. Tune into receiving on the spiritual level living oneness with our God Self. Tune into mental and emotional positive attitudes balancing all of the chakras from base to crown. Physically visualize your organs, and body systems healthy. Let the energy bracelet be a reminder to tune into the 28 positive attitudes and transform the negative attitudes. You can learn more about these negative emotions in Deepika’s book, Embracing the Miraculous, Attaining Optimal Health. There is a chart describing all of the bracelet support in Deepika’s newest book, Holistic Health For All, A Self-Healing Program on 6 Levels. Buy the bracelet and receive the program with the bracelet. These crystal bracelets for self-healing with our consciousness are a new form of holistic medicine. If 10% of us to live Holistic Health on 6 levels blessing all existence, our vibration of love, joy, peace, and enlightenment lifts the rest of humanity creating a world of love. Please Join the Holistic Health For All mission supporting everyone to live Holistic Health on 6 levels.